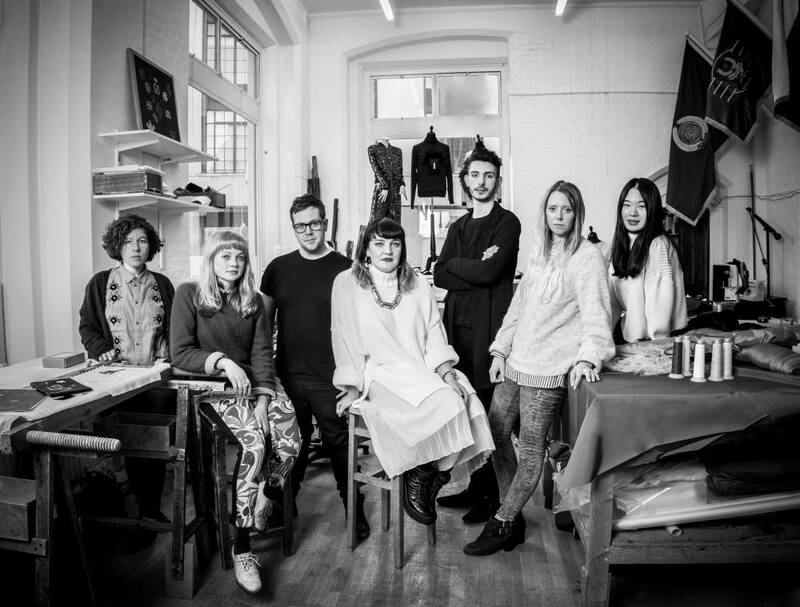 The fashion world not only involves remarkable designers, but also a host of specialised craftspeople, from embroiderers, lacemakers and weavers to pleaters, jewellers and feather workers. Whether still using ancient techniques or adopting new technologies, these artisans continue to display exceptional workmanship and an eye for detail that help to make the imaginations of designers and couturiers a reality. As the season of Fashion Week begins, we look at three companies whose unique skills add lustre and style to the catwalk. 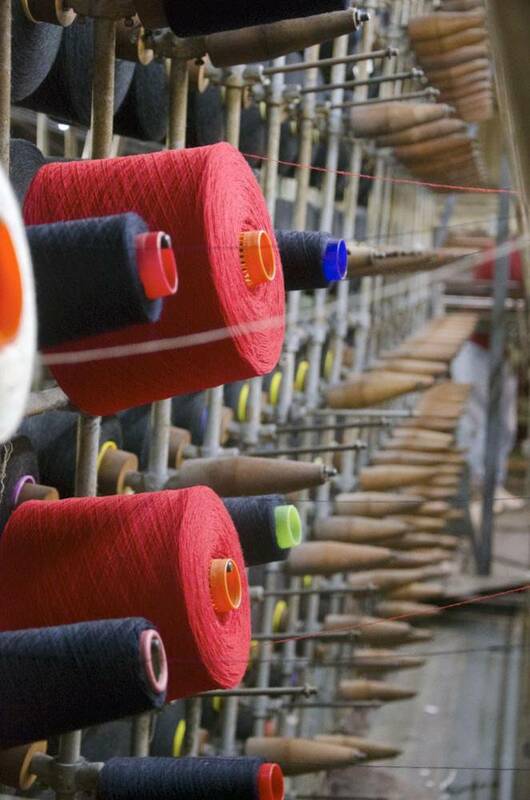 Established almost 250 years ago, Hand & Lock is the oldest embroidery atelier in the UK. Its portfolio of clients includes Dior and Chanel, as well as emerging designers, the British Armed Forces and the Royal Family. Those not familiar with the name of Hand & Lock, will almost certainly have seen their work stitched meticulously on everything, from military regalia to the dazzling embellishment of the most elaborate runway pieces. “What’s special about what we produce today is that it’s so recognisably British. It has a signature look that is associated with our Armed Forces and the Royal Family,” says Jessica Pile, Hand & Lock’s enthusiastic production director. It is a line of work that the company has been producing since its beginnings in 1767, when M Hand, a refugee lacemaker from Flanders, founded M Hand & Co. In 2001, the business merged with the high-fashion embroidery company S Lock Ltd, whose clients included Christian Dior, Norman Hartnell and Hardy Amies. 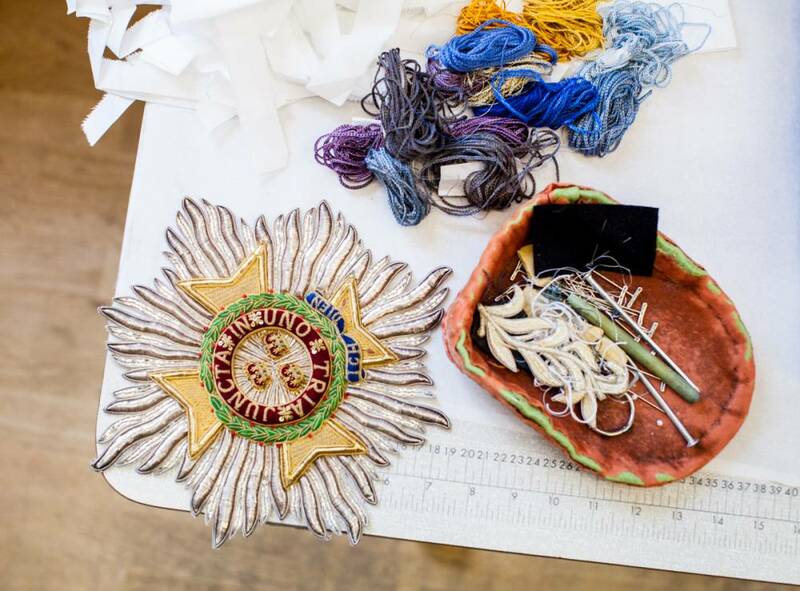 Mixing tradition with high fashion, The Royal Warrant holder’s commissions range from royal ceremonial wear to crests for regimental berets, highly decorated epaulettes and copious amounts of trim for uniforms, as well as work by top international designers. Such variety appeals to the small team of 12 full-time staff, who can find themselves working on couture for Dior one day and embroidering badges for Chanel the next. “We have worked for most of the high-end fashion brands, as well as smaller brands,” says Pile. One of the largest jobs to date was to create heavily beaded and embroidered pieces for Mary Katrantzou’s jewellery-inspired A/W14 collection, including one piece that took an incredible 250 hours of embroidery to complete. Yet even small jobs, such as creating a simple crest, are incredibly time-consuming, taking between 15 and 24 hours to stitch depending on the level of detail. More recently, Hand & Lock created the silver piping embroidery for JW Anderson’s S/S17 menswear collection, and produced 17,000 metres of Russian braid for three intricately embellished jackets in Burberry’s androgynous 2016 September collection. This season, Craig Green called on the atelier to create zigzag stitches for bodice pieces for its A/W17 collection. For Kanye West’s Yeezy athleisure collection, knitted pieces were embellished with embroidered letters. Perhaps the most showstopping is the flag dress that Hand & Lock created for Vivienne Westwood’s A/W17 collection. Taking fabrics from Hand & Lock’s military archives, old flags and laces were refashioned into a dress before being finished with hand-embroidery. even sewn into a design for a collaborative project between Louis Vuitton and the artists Jake and Dinos Chapman. New technologies and materials aside, little has changed at Hand & Lock over the past 250 years. “We are still using the same techniques that were developed centuries ago,” says Pile. Although time-intensive, hand-embroidery produces results that are unrivalled in terms of quality and durability. And as quality cannot be rushed, brands such as Burberry have made standing orders with the atelier for details such as the trim of their classic macs and come to Hand & Lock to monogram their garments. Monogramming is a large part of the business. The team has initialled everything from armfuls of shirts for brands such as Gieves & Hawkes, Turnbull & Asser and Anderson & Sheppard to sleepwear by Olivia von Halle and Desmond & Dempsey. Velvet dress slippers, cufflinks, chairs and even a yoga mat have also been subject to their needles. Major fashion houses such as Dior, Fendi and Stella McCartney have also called on Hand & Lock for in-store monogramming events. 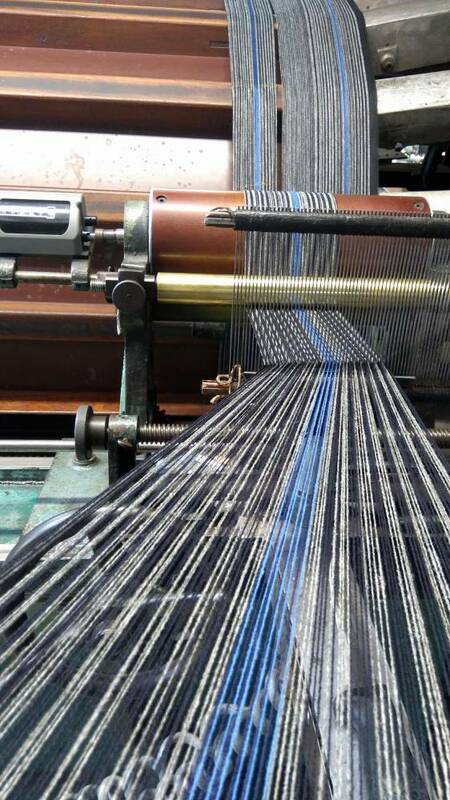 Established in 1772 in Wellington, Somerset, Fox Brothers & Co Ltd supplies and creates cloth for Savile Row tailors, international fashion houses and top designers such as Louis Vuitton and Daks. “Quite simply, if it’s not Fox, it’s not flannel,” says Rosemarie Boon, cloth designer at Fox Brothers & Co. Credited as the original creators of flannel cloth, this is not a bold marketing statement, but a truth that draws on almost 250 years of history. Tailors and designers in Britain are more discreet. Maintaining a centuries-old relationship with the tailors of Savile Row, the company works on an individual basis with each, providing them with specially woven cloths in a variety of styles, shades and weights, ranging from a fluid 180 grams to a generous 1,000 grams. 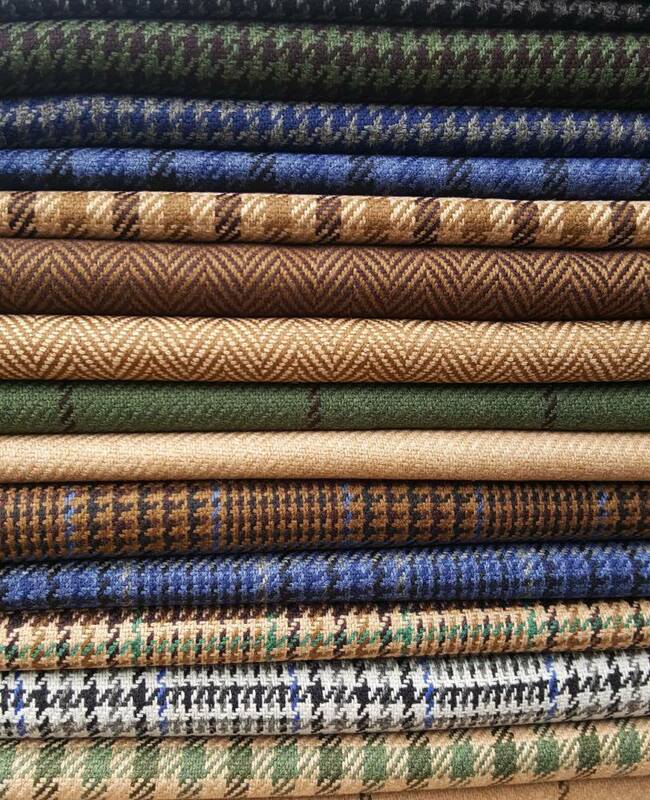 One such label is Anderson & Sheppard, which orders all its exclusive flannel cloth from Fox. “We like to use Fox cloth because it is of the highest quality,” says Colin Heywood, managing director of Anderson & Sheppard. “Our ‘house cut’ is based around the softness and drape of fabrics used and Fox cloths lend themselves perfectly to these characteristics.” For this reason, in 2011 Anderson & Sheppard launched an exclusive in-house service in partnership with the mill, allowing customers to design their own cloth with Fox before making it up into a bespoke suit. Another tailor, Henry Poole, enjoys exclusive rights to the Fox chalk-stripe fabric that was used for Sir Winston Churchill’s famous three-piece suit. And Fox’s commissions are coming increasingly from clients seeking bespoke weaves. The most eccentric was from designer Jeremy Hackett, who had wool from his own flock of Wensleydale sheep woven by the mill into fabric used to create a three-piece suit for Hackett’s A/W15 collection. Most orders, however, involve one-off lengths of cloth or big commercial orders for international luxury brands and fashion houses, including Aquascutum, Trunk Clothiers, Vivienne Westwood and Nike. Younger labels, such as Dries Van Noten and Nigel Cabourn, also approach Fox, as well as emerging British tailors such as Harry Mundy. A more recent project involved collaborating with David Beckham to create a robust cloth for a vintage-inspired military greatcoat for his second collection for Kent & Curwen. It led the team to delve into Fox’s extensive archives to produce an authentic heavyweight cloth. “A lot of our inspiration for new cloths comes from the Fox archives,” explains Boon, who is currently finishing off designing materials for a special A/W18-19 Archive Flannel Collection. It is this reliance on the past that makes Fox so unique. It also means that purchasing Fox cloth is an investment in the preservation of traditional British craft. 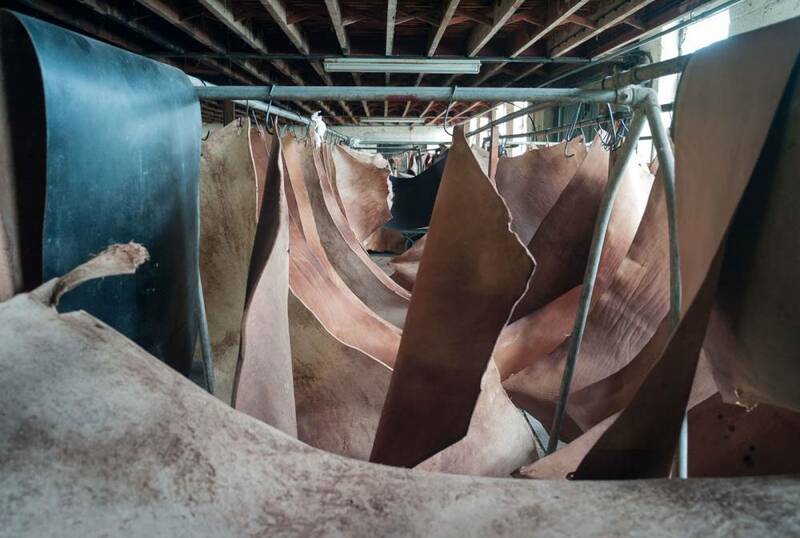 Tucked away in the Devon countryside, the J & FJ Baker tannery has been transforming hides into leather for centuries . Today, its clients include Crockett & Jones and Purdey. Upon arrival at the tannery, the hides are bathed in hydrated lime and water to loosen the hair, then put through a de-hairing machine. From there, they are washed and taken to the tan yard, where they are immersed in oak bark liquor for 12 months to tan before they can be dried, dressed and finished. “Our tanning material is oak bark, ” says Parr. Stripped from the trees during the summer, the bark is stored for three years to dry, then ground down into small pieces, added to water and soaked to release the tannins. “It is very much like making tea, but with cold water,” he adds. Once the tanning liquor is strong enough to use, which takes around a month, it is pumped into the tan yard. 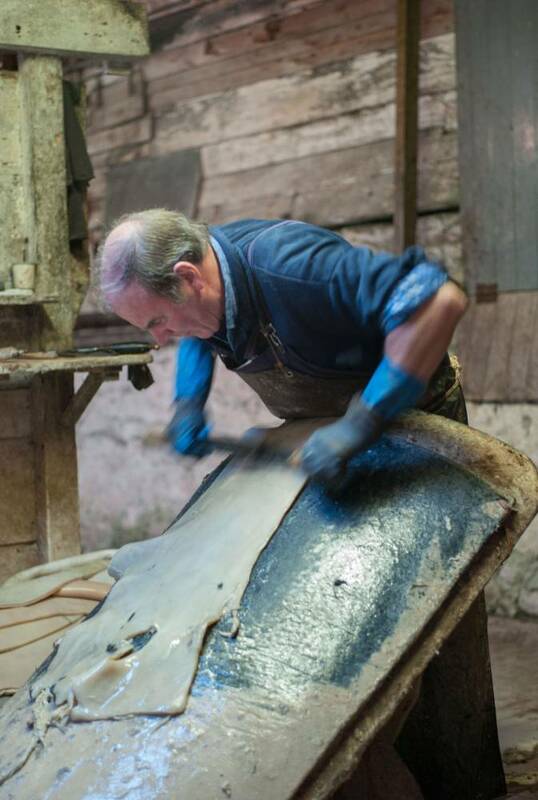 With orders for shoe leather forming 50% of the tannery’s business, these qualities are highly sought after. Sole leather aside, the 21 staff at J & FJ Baker also produce leathers for toe puffs, stiffeners and for the upper material of shoes for many London cobblers, including Gaziano & Girling, John Lobb and Crockett & Jones — for which they make a special Russian Grain leather from young ox hides according to a 300-year-old recipe. “It’s a leather unlike anything we have ever worked with,” says James Fox, marketing manager at Crockett & Jones. 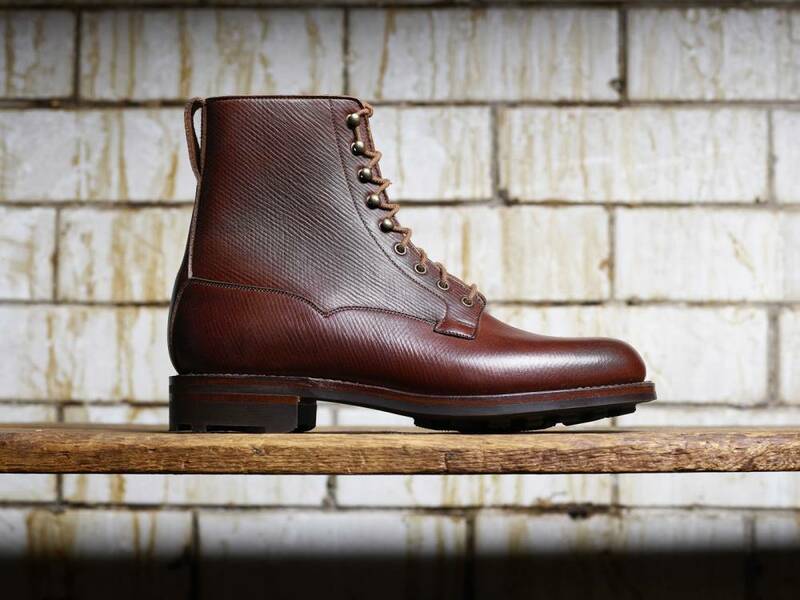 “It has a distinctive aroma and hatch-grain texture that produces hard-wearing boots and shoes.” Exclusive to Crockett & Jones, the leather has been used to create textured versions of the brand’s classic Radnor boot. With demand for oak-tanned leather having grown over the past few years, London brands and country outfitters alike are turning to the tannery for its superior product. Gun and rifle-makers Purdey created its recent Audley luggage collection from J & FJ Baker’s leather, while Globe-Trotter sources much of its leather for luggage from the tannery.